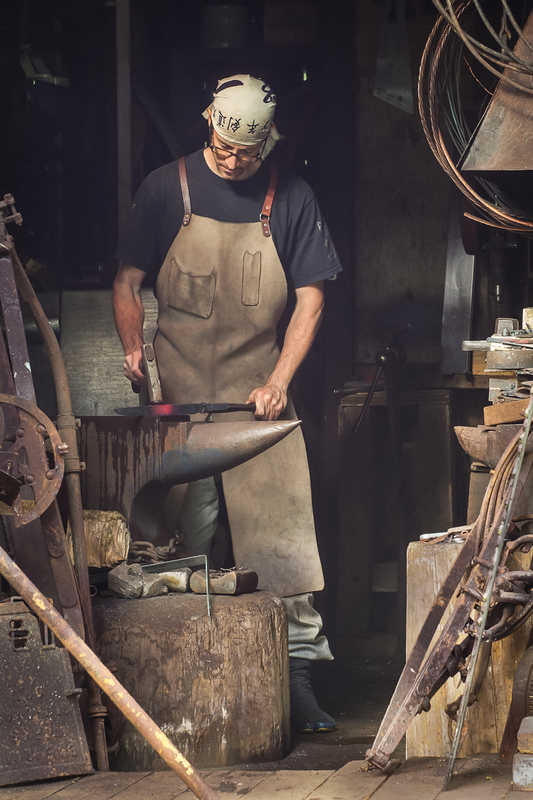 Arashiage is the stage of rough shaping following hizukuri (forging) and in preparation for yaki-ire (hardening). Earlier posts have described tanto kata and the geometry of the tang, machi, blade, and kissaki. Familiarity with these geometry points is a prerequisite to success in this stage. 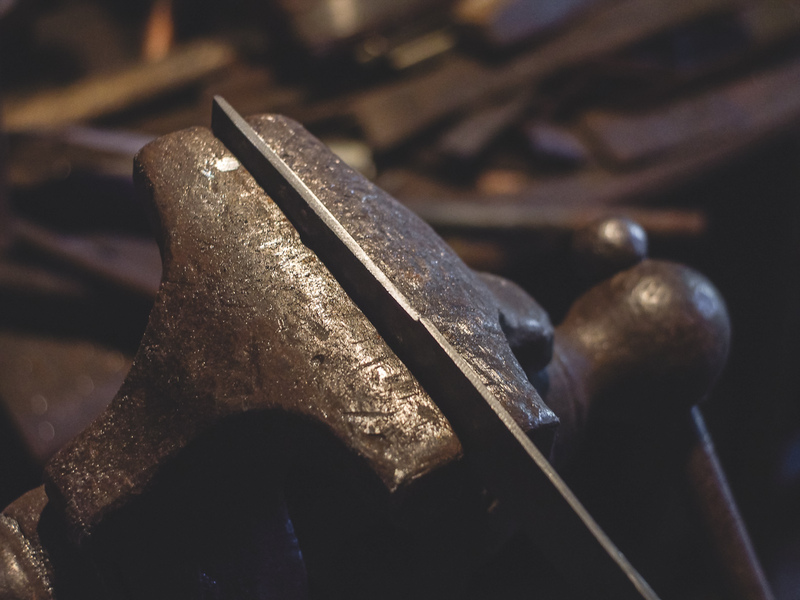 This post will illustrate the proper order of operations for refining the rough shape of the forged blade using sen, hand files, a vise, and a sen dai. This discussion will not cover all minute techniques and nuances, but will provide a clear framework to build upon. 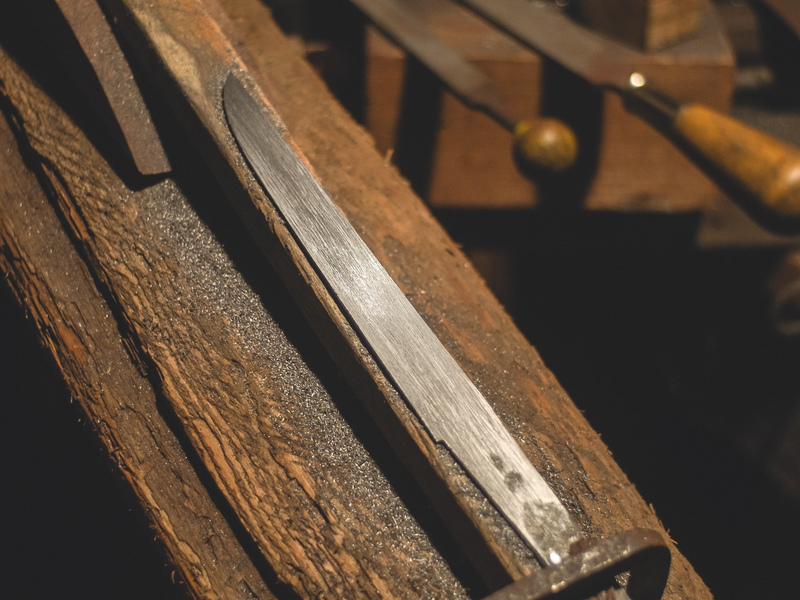 The general approach is to always start at the tip and work toward the tang end, beginning along the spine and then repeating along the edge and then repeating again for the bevels. 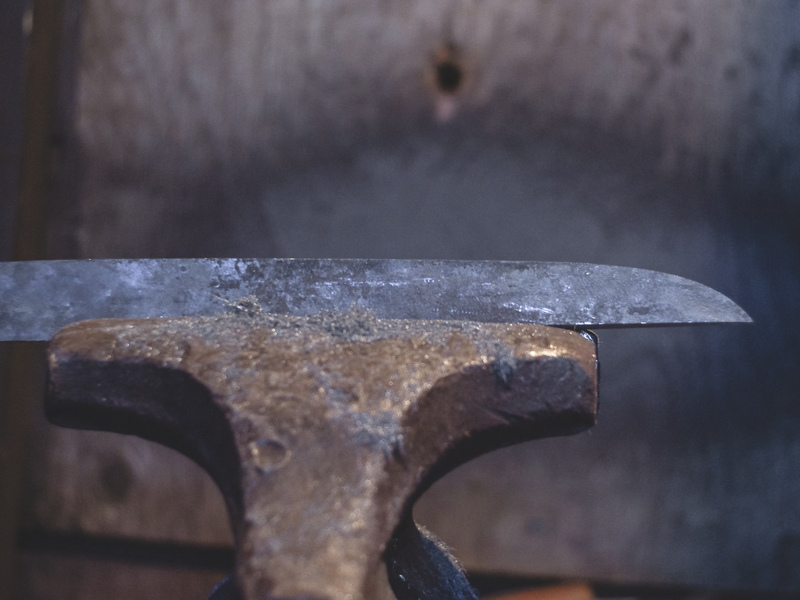 Specifically, file the mune, munemachi, nakago no mune, edge profile, hamachi, nakago no ha, tip of the tang, and finally shape the blade bevels and then the tang bevels. 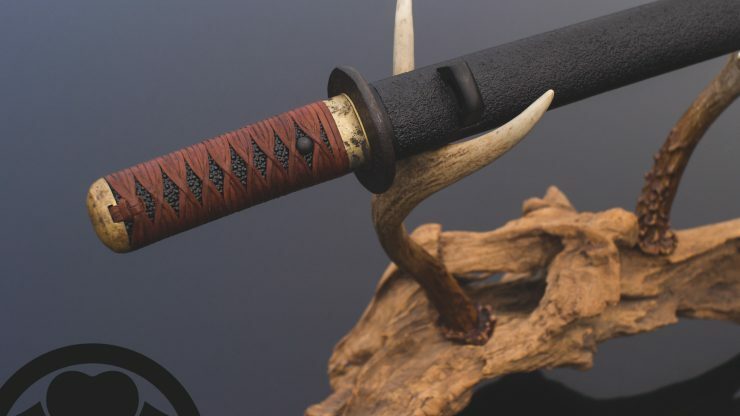 The classical tanto form is informed by both functional requirements and traditional aesthetics, understanding both is required for success. 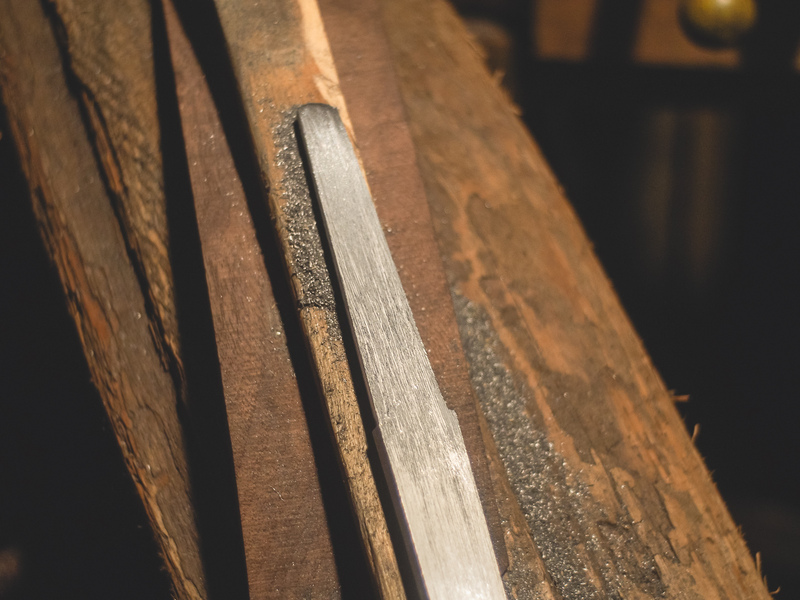 Before beginning arashiage, the blade should be normalized (not annealed, it clogs the files too easily) and straightened as much as possible using a small hammer and a stump. 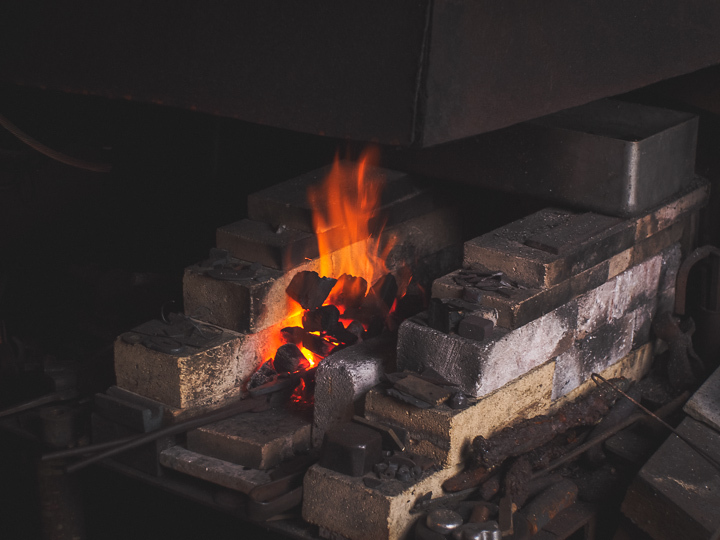 During the initial stages of arashiage the straightening stump may be revisited as necessary to adjust lines and preserve as much steel as possible but care must be taken not to deform the edges of areas already filed. 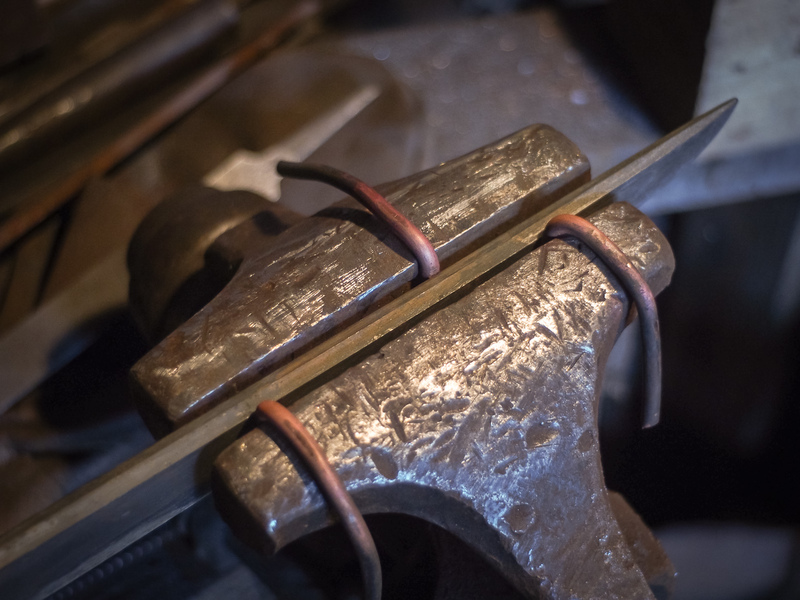 After work on the bevels has begun any further straightening should be done with a copper or wooden mallet or with copper rods in the vise to prevent marring. This is the full edit video, 4x speed short version here. 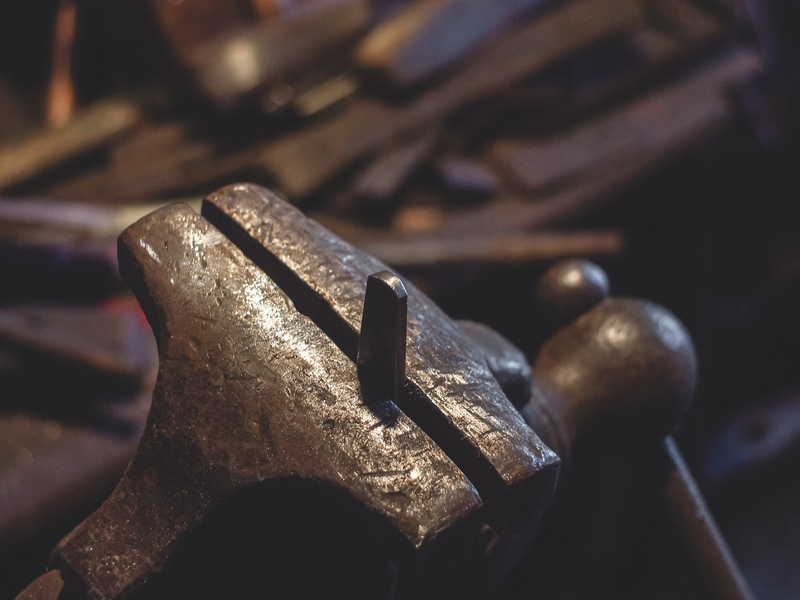 The mune is forged in during hizukuri but often needs a fair bit of work to define and true up. 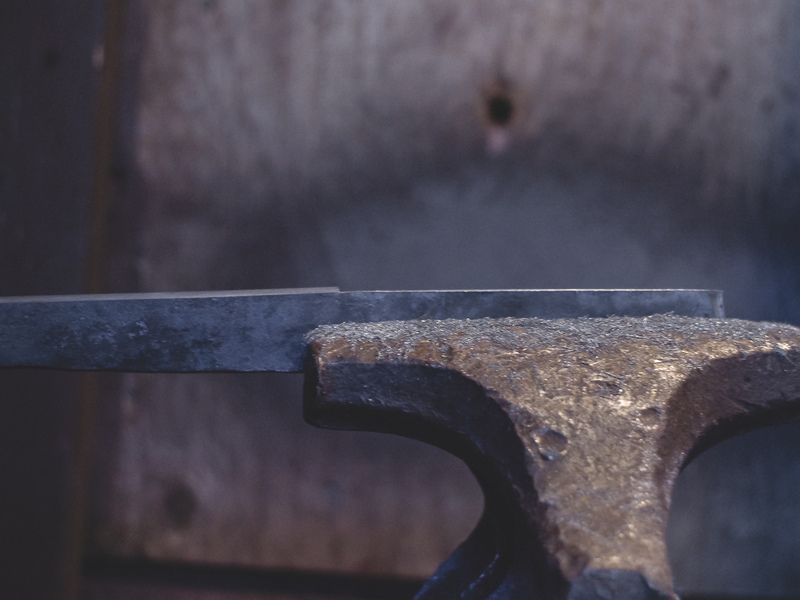 Using a sen scraper or an old rasp to remove forge scale before filing is a simple way to increase the longevity of the files. At this stage any irregularities in the planes or angles of the spine should be cleaned up and a degree of reverse sori in proportion to they type of hamon intended. Sighting down the spine and regularly removing the blade from the vise to check the geometry will help prevent uneven angles and wavy lines. The spine should be as complete and accurate as possible before moving on to the munemachi. Draw filing is a useful technique for refining the surface once the planes have been established. 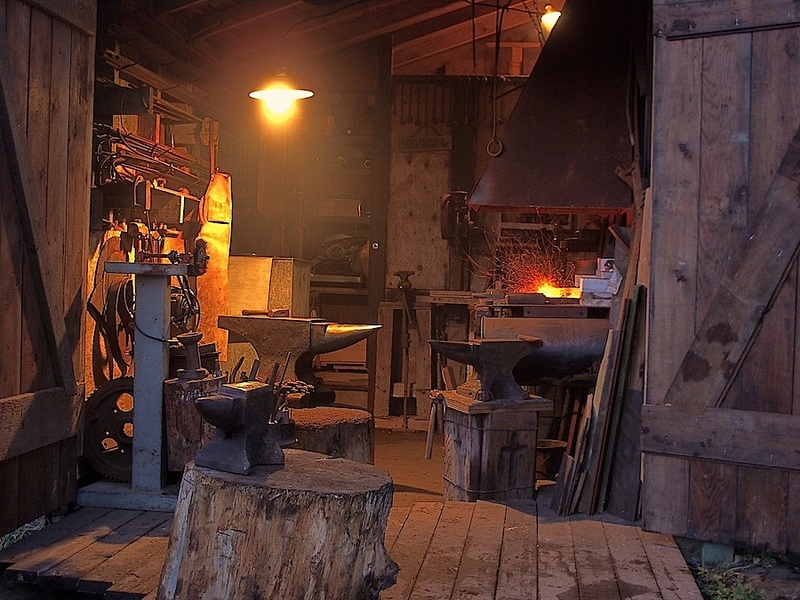 The munemachi is partially forged in during hizukuri but must be filed after filing the mune. If the order is reversed the file will mar the edge of the munemachi and cause it to droop, opposite of what it should be doing right at that point. 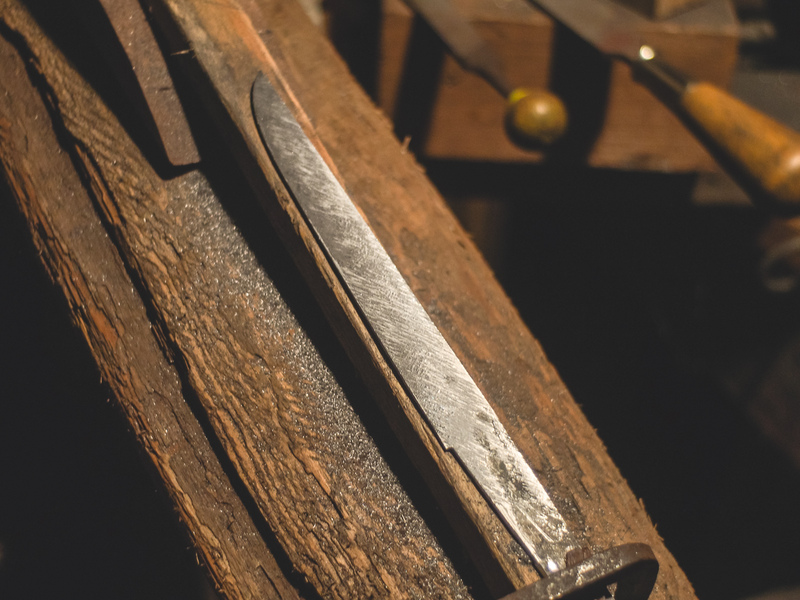 The notch is placed according to the tang and blade length and filed square to the mune rather than “kinked” upwards. Check often to prevent the notch from becoming lower on one side. Take great care not to slip and run the file over the mune at this point as it will necessitate removing a large amount of material to correct. The areas of the spine on either side of the munemachi should align with one another in a fairly straight line. The spine of the tang continues this line towards the tip of the tang. A steep 45 degree chamfer reflects light and reveals a high spot in the centre and establishes a line to be filed down to. Checking often and sighting down the spine will help prevent any bulges or dips in the flow of this line. If the motokasane is particularly wide a very slight rounding is sometimes applied across the spine of the tang. 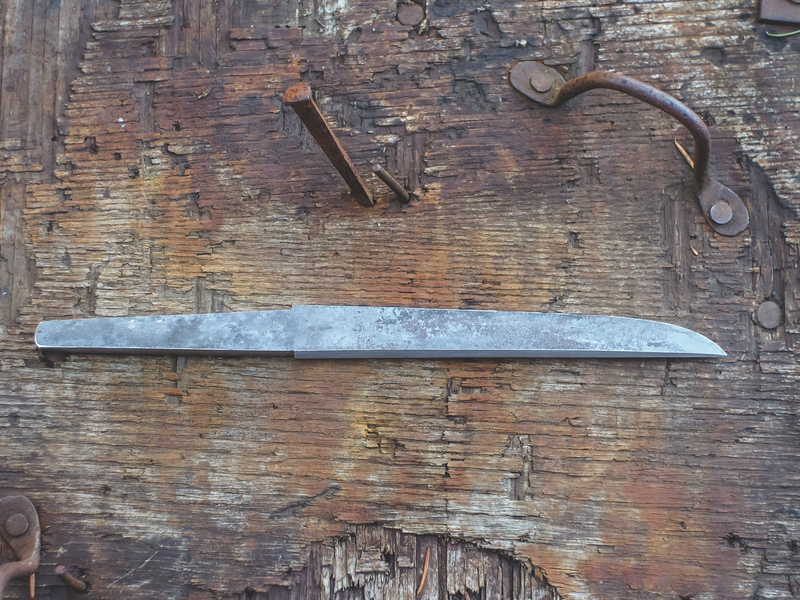 Moving back to the tip, the blade is flipped over in the vise and the edge profile cleaned up from tip to base of the tang. Reverse sori must be included here in anticipation for yakiire. Establishing an edge line with a steep 45 degree chamfer gives a guideline to file down towards. If the edge is too narrow, particularly in the area of the hamachi, it must be filed down until it is 1-2mm thick all the way along. Sight along the edge often and hold up to the light to check the profile. 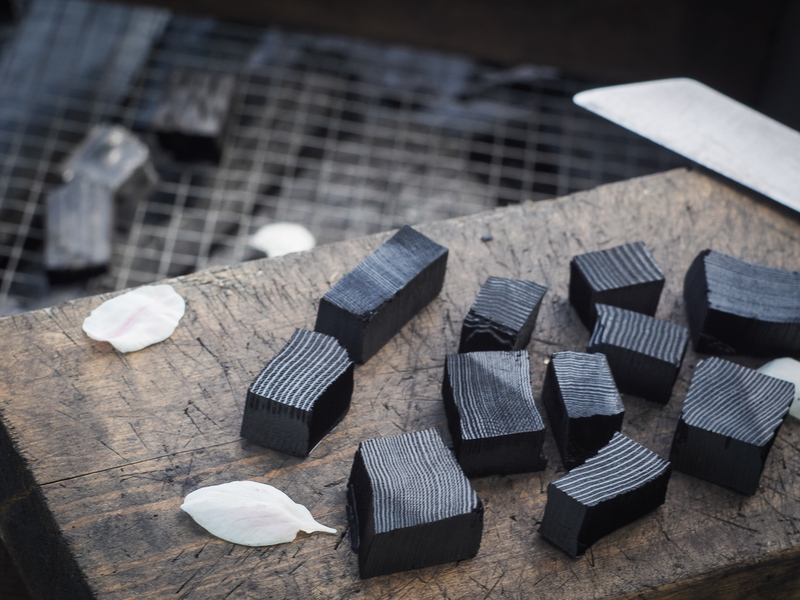 The hamachi is not forged in during hizukuri as it is thin enough to file in. Placing the hamachi is done by approximating 90 degrees from the spine next to the munemachi and marking the hamachi at a perpendicular point. Great care should be exercised not to allow the file to bite too deeply and move the hamachi out of line with the munemachi. Read more about the geometry of this area. The machi should be in line with one another and perpendicular to the mune. The line from the hamachi is continued to the end of the tang. Using a kata will help develop the sense of proportion of thickness and taper required to create this part of the tang geometry. In the meantime this stage may need to be revisited after establishing the bevels. It is also helpful to check if the length of the tang is correct before committing to a final profile here. A steep 45 degree chamfer showing a bulge in the centre that needs more work. 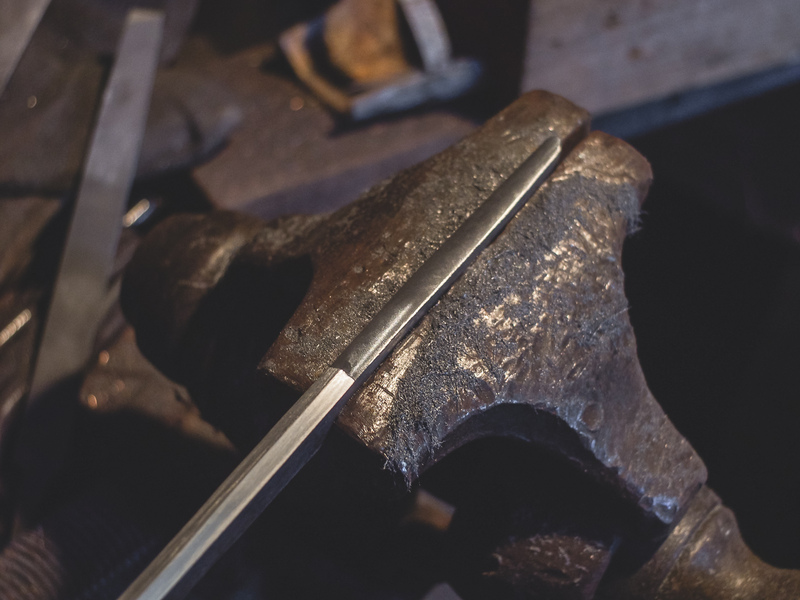 The blade is placed point down in the vise and filed to finished shape. If there is an excess of material here beyond a couple of mm, a hacksaw may be used first. The most common form is rounded or slightly rounded, called kurijiri. The tip of the tang should be rounded in one direction but flat in the other. 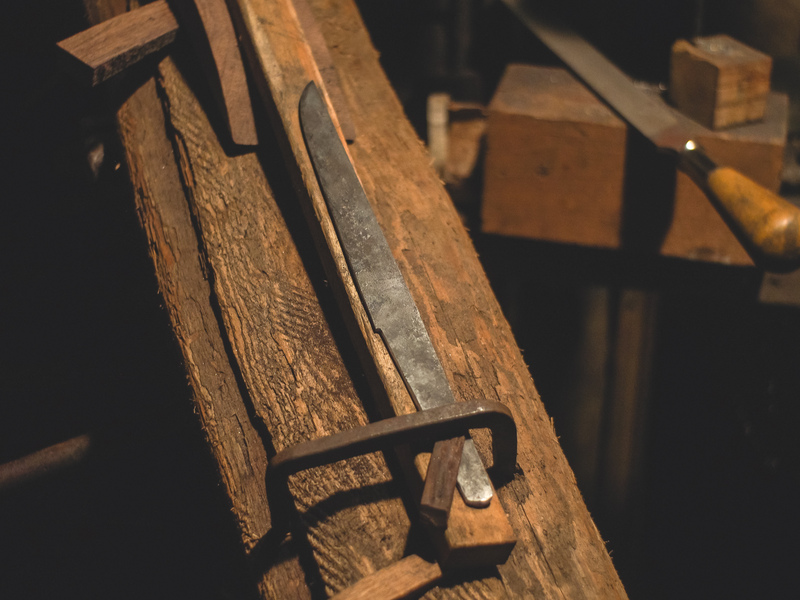 At this point the profile has been completed but the bevels remain as-forged. All of the above profile work should be complete and as accurate as possible before moving on to the bevels. 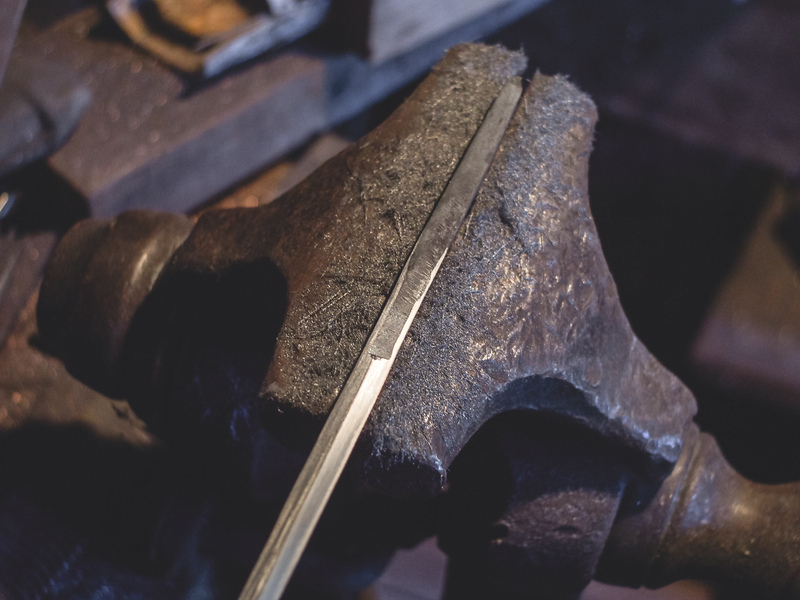 After the bevels have been refined in the sen dai, moving back to the vise will mar the bevel surfaces. The goal of this stage is to true up the lines along the spine and edge and then flatten the area between them. Filing a steep 45 degree chamfer along the edge establishes a line and then the material is removed down to meet it. 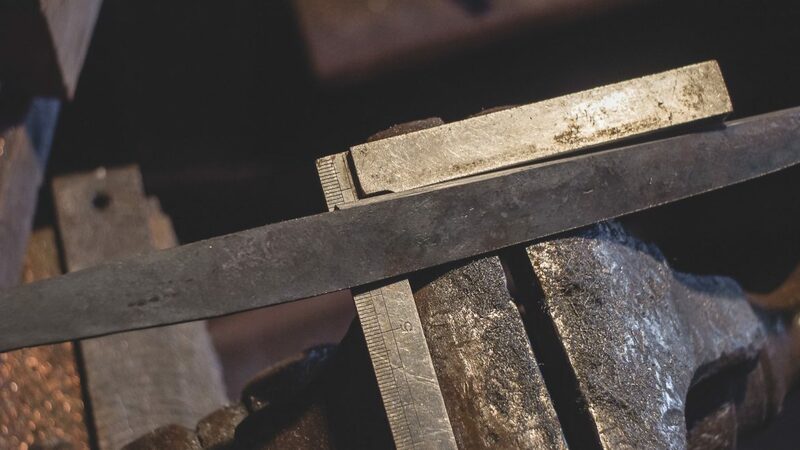 Hirazukuri (single bevel) tanto are mainly flat from the mune to the ha, but should have at least a small degree of convex or haniku (“meat” behind the edge), to provide strength. Because the edge is still 1-2mm thick the bevels should be about as flat as they can be filed at this point to save time after yakiire. Great care must be taken at the now-exposed hamachi and munemachi as too much pressure on the file or sen and the entire shape will be broken. 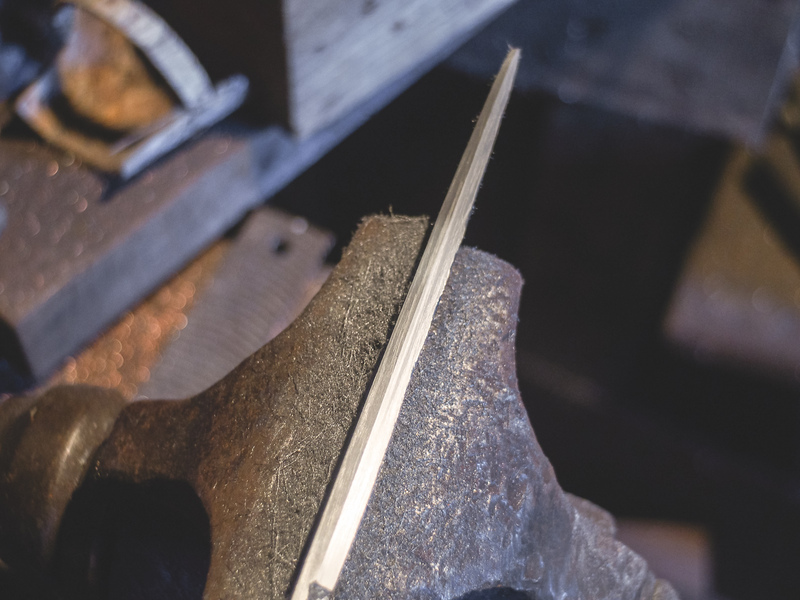 Thinning the hamachi too much and rounding off the edge line would require the whole edge profile and bevels to be taken down further to realign with it (leaving some ubuha, at least at this stage, is one form of protection from this error). 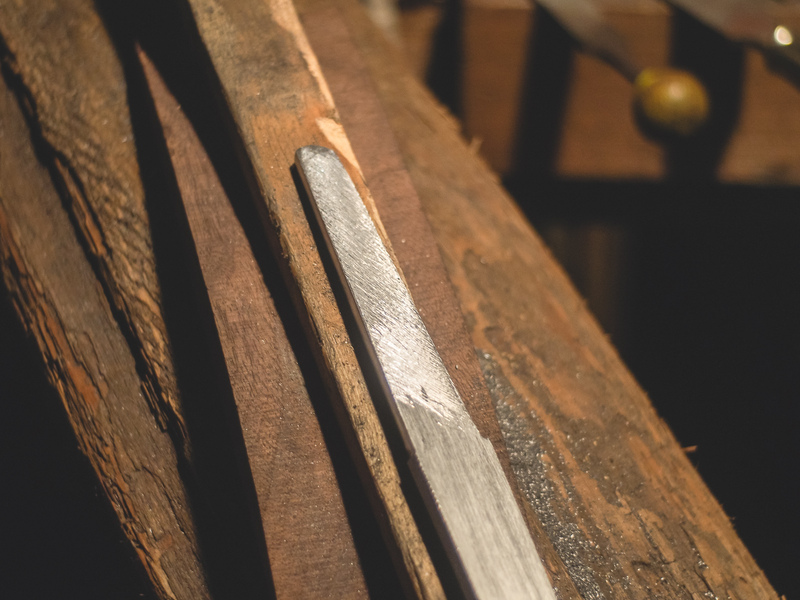 Thinning the vulnerable corners of the mune at the machi would require the rest of the mune to be thinned accordingly and the bevels to be re created to align with it. 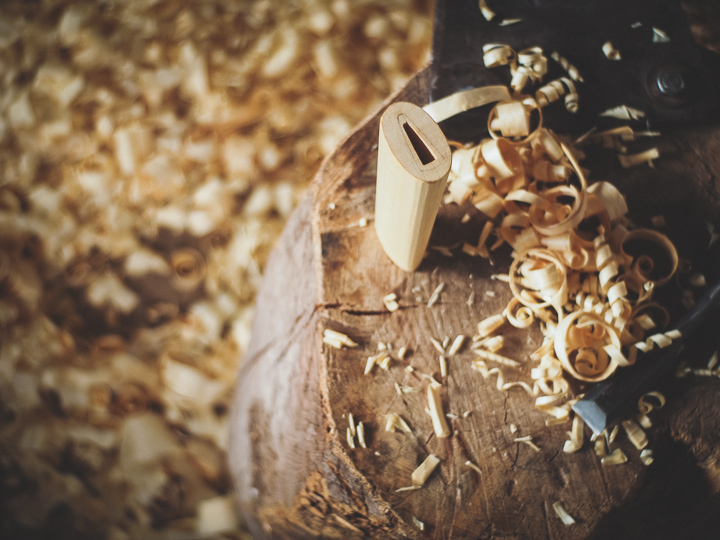 The simple sen dai clamps the blade flat between wooden wedges and blocks and does not mar the surface. Filing at a diagonal angle first to work on specific areas, checking often for dips and waves. Draw filing to check flatness and continuity. Great care is taken not to apply too much pressure to the exposed corners of the ha or mune at the machi. 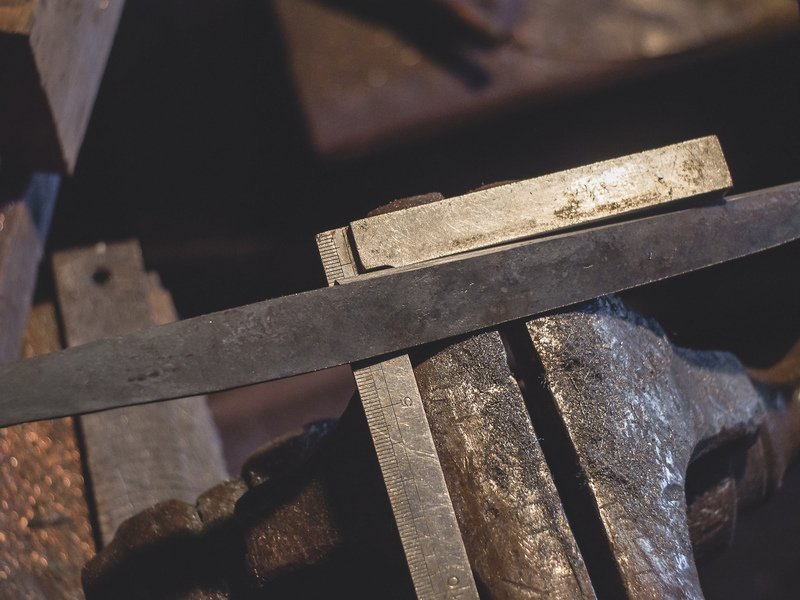 As with the blade bevels, a steep chamfer is filed on all edges to set the target lines. Filing down towards them and checking regularly from multiple angles to keep the geometry as even as possible. Finishing is done with careful draw filing. 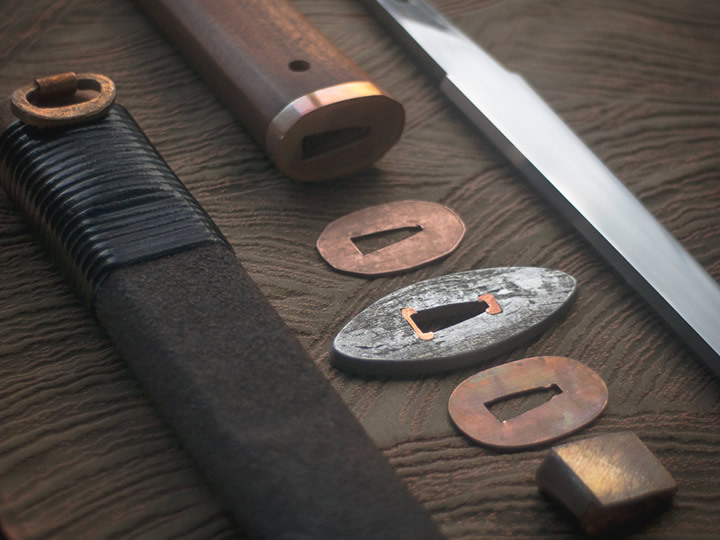 Care must be taken not to remove too much material around the machi, either where the habaki will sit or on the blade bevels next to them. Finally, all edges are very lightly chamfered by drawfiling to remove burrs without altering the shape of the edges. Filing down to the lines set by the chamfers. Drawfiling to check continuity. The blade will be left with this rough surface to help keep the clay on during yakiire. 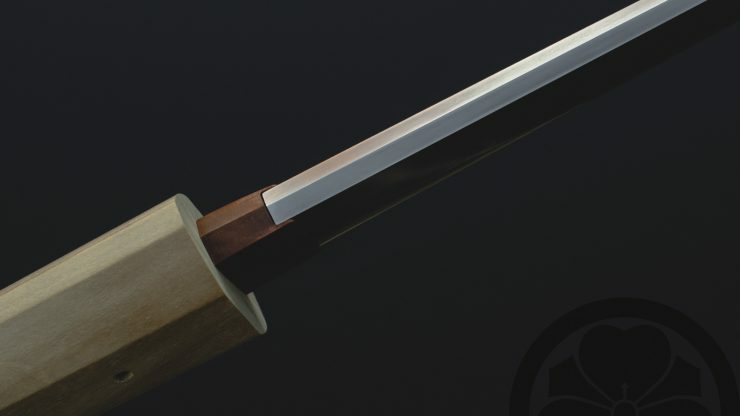 Read about kata, the nakago (tang) & machi and blade & kissaki or view the whole classical tanto geometry archive. Posted in Handcrafted Knives.Tagged Instruction, Process, Tanto Geometry.